Mass protests continue across Egypt in the wake of Wednesday’s US-backed military coup against Islamist President Mohamed Mursi. While it persists in the crackdown on Mursi’s Muslim Brotherhood (MB), the military junta has failed to assemble a civilian puppet government amid conflicts over posts with those Islamist parties that back the coup. Weekend protests followed on from the violent clashes that took place throughout Egypt on Friday, in which at least 36 people were killed and over 1,400 wounded. On Sunday, hundreds of thousands of anti-Mursi protesters poured into downtown Cairo’s Tahrir Square, while several thousand MB supporters blocked the Salah Salem Road in Heliopolis, a Cairo suburb, to protest the coup. Protests and clashes also continued in Alexandria, Egypt’s second-largest city. A widely circulated YouTube video posted on Saturday showed what were believed to be Islamist supporters throwing two young men off a building in Alexandria. Clashes also occurred in Mansoura and Tanta, Egypt’s eighth and tenth largest cities, between pro-and anti-Mursi protesters. 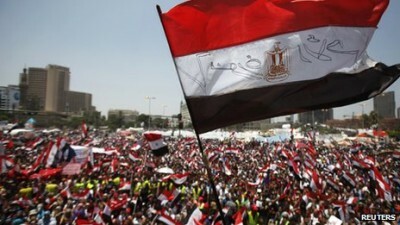 There were mounting signs of armed resistance to the coup by Islamist forces, threatening to tip Egypt into civil war. Gama’a Islamiyah, a far-right Islamist party that has carried out terrorist attacks inside Egypt, yesterday called for the removal of newly-installed President Adly Mansour. Egyptian Islamists are reportedly founding a domestic branch of Ansar al-Sharia, a militia in neighboring Libya, to organize armed resistance to the Egyptian junta. Ansar al-Sharia fought against Colonel Muammar Gaddafi in the 2011 NATO-led war in Libya; it subsequently was suspected of organizing the September 2012 attacks on the US consulate in Benghazi. Fighting also continued in Egypt’s Sinai Peninsula, a center of Islamist support. Four army checkpoints were attacked and a pipeline carrying gas to Jordan was bombed on Saturday, and fears of sectarian bloodshed intensified after Coptic Christian priest Mina Aboud Sharween was shot dead. Yesterday the Sinai-based Salafi Jihadi group issued a statement saying that the Sinai was affected by “current events ravaging the country.” It threatened attacks on “repressive practices” by Egyptian army and police forces. The ongoing protests and the toppling of Mursi are the outcome in large measure of a powerful wave of working class struggles that has grown and shaken Egypt over the last year, reprising the powerful strike wave that led to the ouster of US-backed dictator Hosni Mubarak in February 2011. Last year saw 3,817 labor strikes and protests over economic demands, the vast majority (71 percent) of which occurred after Mursi’s election at the end of June 2012, according to recent studies by Egypt’s International Development Center. The trend accelerated this year: in the first five months of 2013 alone Egypt experienced 5,544 strikes and related demonstrations. While some were briefly noted in major Western media—like the February Sokhna port workers’ strike for permanent jobs, or the April railway strike—the vast majority of these struggles go completely unreported. As opposition to Mursi built up in the working class, powerful sections of the US foreign policy establishment and the Egyptian ruling class concluded that the Islamist president had to go. The Egyptian army—working in close coordination with the Pentagon, which funds the country’s military to the tune of $1.3 billion per year—ousted Mursi, placing him under house arrest and issuing arrest warrants for hundreds of MB leaders. While the ouster of Mursi was broadly popular in Egypt, the junta that has taken its place is an army-run regime aligned with US foreign policy and the interest of the banks. While the coup organizers’ initial target is the MB, their aim is to end the ferment in the working class, slash state subsidies that keep fuel and grain prices affordable for Egypt’s impoverished population, and crush popular opposition to Washington’s Middle East wars. The goals that drove the population into struggle against Mursi cannot be achieved by supporting this regime, but only by unifying workers in struggle against US imperialism and its capitalist allies in the Middle East. The clearest sign of the reactionary character of the army coup is that it has Washington’s support. The Obama administration has refrained from labeling it a coup, which might trigger a cut-off in US financial aid to the Egyptian military. On Saturday, US Defense Secretary Chuck Hagel spoke to Egyptian Defense Minister General Abdul Fattah al-Sisi, the leader of the junta, calling for al-Sisi to arrange a peaceful political “transition” in Egypt. After repeated announcements that the army would name National Salvation Front (NSF) leader Mohamed ElBaradei prime minister, Egypt’s state-run daily Al Ahram reported that there had been no successful conclusion to talks on forming a government. Instead, General Authority for Investment official Ziad Bahaa El Din had been offered the position. ElBaradei is now being considered for the vice presidency instead. Now, ElBaradei’s “conscience” is encouraging him to seek various positions in a government assembled on the basis of a naked military coup. His role would be to draw on his experience as a former UN official to secure recognition for the army regime and loans from the International Monetary Fund, which would be used to boost investment in Egypt in exchange for deep cuts to social spending to balance that nation’s budget. Resistance to ElBaradei’s nomination came primarily from the Salafist Nour Party, which the army has sought to maintain as part of its coalition in order to prevent Salafist groups from moving into armed struggle against the junta. The party’s presence in the army coalition is further evidence of the reactionary character of the coup.